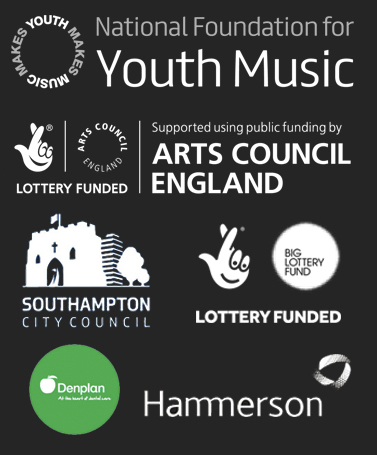 SoCo Music Project is a leading provider of informal creative engagement in the South of England. We are passionate about making a difference by providing positive, creative music opportunities for all. Our work transforms participants’ lives through the power of music, taking participants on a journey of discovery that for many, forms a vital part of their recovery and rehabilitation back into society. SoCo is project funded and does not receive any core funding; therefore, it is only possible for us to continue our unique and innovative service through the generous support of grant-giving organisations, sponsorship and donations from individuals. One-off Donations will enable us to obtain learning materials and resources, upgrade our specialised music equipment, provide training opportunities for staff or fund part of or an entire learning programme or event for vulnerable groups. Regular giving can make a big difference to our delivery by allowing us to provide continued engagement with user groups or to develop new projects with vulnerable groups across the county. We are currently seeking some lead donors to pledge a minimum £10,000 donation. These donors will play a transformative role in supporting SoCo to realise our future plans and play a vital role in making substantial and positive change within the local community. Would supporting an innovative, inspiring and exciting charitable organisation benefit your business? SoCo Music Project would love to develop mutually-beneficial partnerships with corporate sponsors through our Business Sponsorship Scheme. Your support will make a real difference to people most in need by enhancing our creative offer in the region, whilst in the process helping you to meet your corporate responsibility aims. The user groups we work with, type of activities we deliver and geographical location can vary greatly for each project, allowing for a range of sponsorship opportunities available at different levels. Please get in contact to tell us how you would like to support us and to find out what benefits there may be to a partnership. For more information, please see our FAQs, alternatively, get in touch with us here – we would love to hear from you!